Irving Mosquito says his first Indigenous All Stars Summit was one to cherish. First-year Bomber Irving Mosquito shares his answers to some light-hearted questions. Small forward selected with pick 38 in the 2018 NAB AFL Draft who can turn the game with his dazzling agility and goal sense. 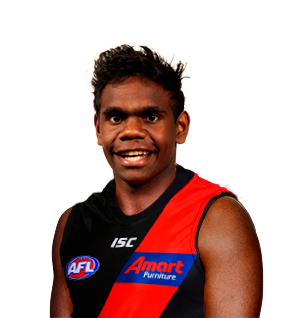 The Gippsland Power product, who originally hails from the remote Kimberley town of Halls Creek in Western Australia, grew up as a passionate Bombers supporter and his infectious enthusiasm is sure to prove valuable at The Hangar in 2019. The speedy goalkicker is extremely dangerous in attack, while he can also utilise his athleticism to break the lines through the middle of the ground and bust open the contest. Mosquito is sure to excite fans with his energetic gameplay and beaming smile throughout his first season at the club.